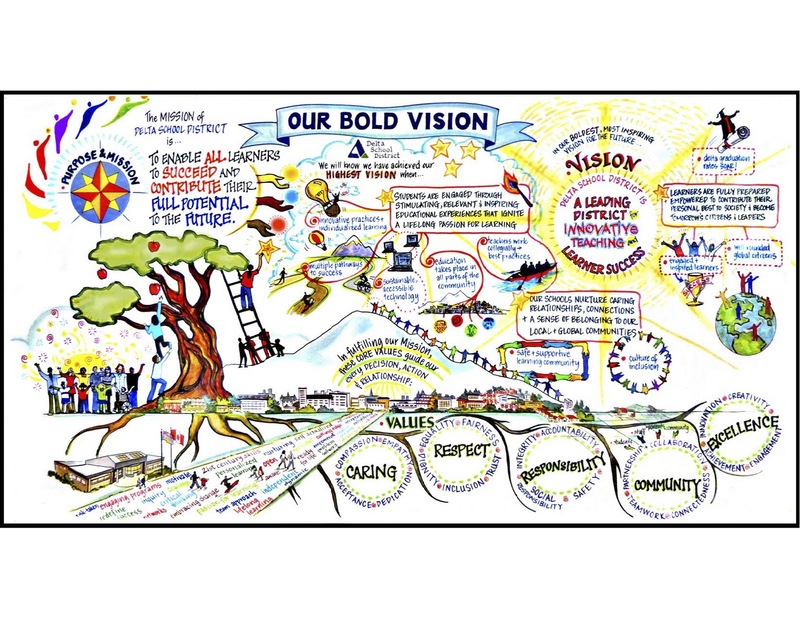 Last spring, the Delta School District completed an ambitious process of developing an inclusive and inspiring vision of the future. The process included visioning exercises at each school and a number of district events, during which students, parents, support staff, teachers and administrators participated in engaging conversations around learning. Beginning with an appreciative inquiry process, we celebrated our successes in order to reveal the answers to three very important questions. In our boldest vision and most fantastic dream of the future, what do we want to do and be? The process created a sense of belonging for school district and reminded us of the importance of working together as we work towards our bold vision. As a result of our collaborative efforts, WE now share the bold and inspiring vision of 'becoming a leading district for innovative teaching and learning' and are ready to embark on the challenge of creating new realities in educational change. Below, is a short video capturing some of the conversations that we are having with students across the district as we move forward in our quest to realize our bold vision of the future for Delta schools.